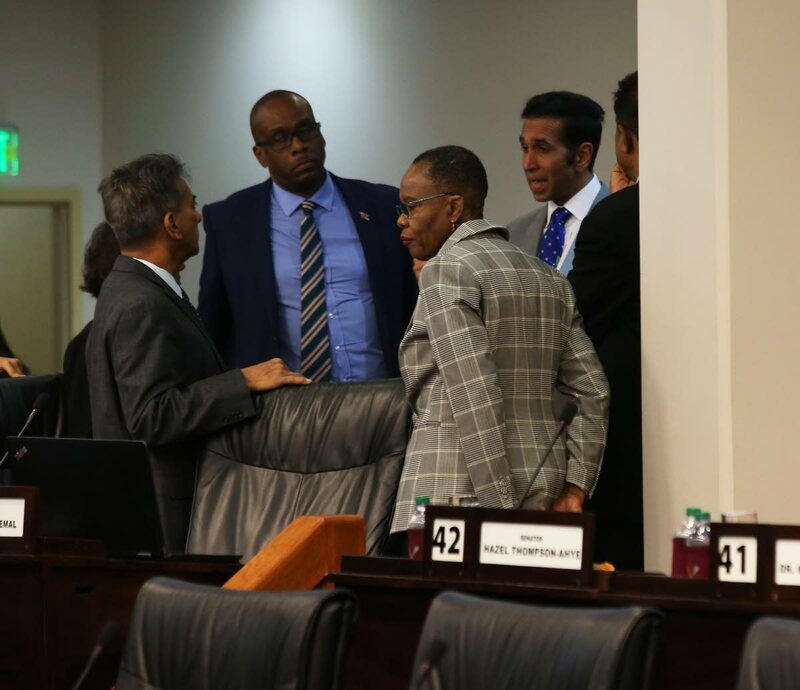 Attorney General Faris Al-Rawi, right, has a conversation with Independent Senators, from left, Dr Varma Deyalsingh, Paul Richards and Dr Maria Dillon-Remy during yesterday's sitting of the Senate in Parliament yesterday. THE Senate on Thursday night passed the Non-Profit Organisations Bill 2019. The bill was passed with amendments by a vote of 24 in favour and six opposed. The 24 senators voting for the bill comprised all 15 government senators and the nine independent senators. The passage of the bill came after a heated Senate sitting on Tuesday and an, at times, tense committee meeting on Thursday. The bill will now return to the House of Representatives for the Senate amendments to be approved. When the bill was passed in the House on March 29, no amendments were made to it. Earlier in the sitting, Government and Independent senators outvoted their Opposition counterparts to ensure that the Civil Asset Recovery and Management and Unexplained Wealth Bill 2019 will be debated in the Senate on Monday. Attorney General Faris Al-Rawi had proposed the bill be debated by the Senate on Monday but his proposal was bluntly rejected by Opposition senators. Opposition Senator Wade Mark demanded a division. When the division was taken, the Opposition lost the vote, 22 to six. The eight independent senators (Paul Richards, Anthony Vieira, Deoroop Teemul, Anita Deonarine, Maria Dillon-Remy, Hazel Thompson Ahye, Charisse Seepersad and Josh Drayton) voted with the 22 government senators. The bill was passed with amendments in the House of Representatives by all 34 MPs present (Government and Opposition). After the bill's passage, Government and the Opposition each took credit for it. National Security Minister Stuart Young said, “We are satisfied that citizens can be comforted that this bill is an important piece of legislation in the Government’s fight against crime.” The Communications Ministry said the bill allowed specific agencies to have greater teeth in criminal investigations into identified serious crimes such as racketeering, counterfeiting, trafficking in stolen goods, murder, tax crimes, extortion, insider trading and market manipulation. Finance Minister Colm Imbert said Government made seven amendments to the legislation and agreed to five proposed by the Opposition. “Landmark legislation that was long overdue. Only this PNM Government can do this,” Imbert declared. The Opposition Leader said the Opposition always supported any legislation which allowed law enforcement to combat the criminal element and go after ill-gotten gains. Kamla Persad-Bissessar added the Opposition would not support legislation that compromised the rights of citizens, undermined the rule of law and gave law enforcement the ability to target innocent citizens and unlawfully take away their property. Reply to "Non Profit Organisation Bill passed"